Sometimes…you can’t change things. You want to, but you can’t. I’ve spent the past two weeks wanting to either control and/or change things in my life. And… there are some things I can change. The color of my bathroom walls for example. (that’s how I spent most of my weekend) However, there are also things that I can’t change. I can’t make ultrasound results happen faster or be different. I can’t make blood test results or biopsy results happen any faster than what they will be. And truth, I can’t change whatever it is now that my doctor is looking for. I know today that it’s not endometrial cancer, and for that, I am truly grateful and thankful to God. I still have an MRI in my future, because there is still something that’s just not quite right. Next Thursday we get that done. 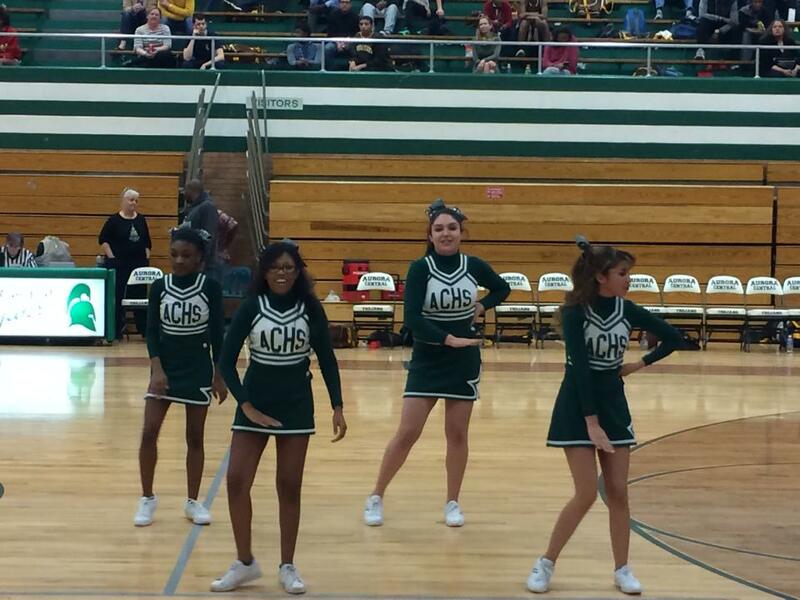 Aurora Central cheer leaders 2015. We all have school spirit! All serious things for sure. Today something even more serious happened, at least from my crazy perspective. It’s #tbt or Throw Back Thursday. Today, an alum of my high school posted here cheer squad picture from 1979. Truly, it’s a fun picture, I love that there is Farrah Fawcett hair, I love the embroidered skirts… It was probably a pretty great day in 1979. So this picture…it’s a picture that reflected Aurora Central at the time, as near as I can tell, given I was about six years old. But in this picture, there are no African American girls, there are no Latina girls, there are no Asian girls either. It caught the attention of someone else out there in FB land. So rather than wondering who those ladies are…what are they doing now, it sparked a pretty heated conversation about the state of race relations in 1979. Guess what? Sometimes…you can’t change things. We can’t change that in 1979 the cheerleaders at Aurora Central High School were white girls. Just the same as the squad today, is primarily, if not all African American or Latina girls. It is a picture of what and who Aurora Central is today. Understand, I am not making commentary on is it good or bad, frankly, I’m all in for the diversity of the school. I believe the fabric of the community is stronger for it. But just the same it created a space for a conversation about something that we can’t change. We can’t change 1979, whether or not there was a need to change 1979. We can choose what we do with 2015, 2016, 2017… We can change how we show up today, the choices we make and the stands we choose to take. Today my stand, is to accept that there are things I can’t change. I don’t like it, but it’s true. Today, my stand, is also to really live the hashtag I dutifully use #alwaysatrojan. I am not a white trojan, a girl trojan, a cheerleader trojan, a Latin club trojan, a Letterman club trojan, a Student Government trojan… I am simply #alwaysatrojan. This entry was posted in Life and tagged #tbt, Adversity, Aurora Central High School, Change, Choice. Bookmark the permalink. Lizzie Boo, you helped me realize something too. I didn’t go to school in A-Town, my school colors were black and orange and I am proud to be a BHS Bronc. However, I to am #alwaysatrojan . Decades spent there as an employee and countless hours given to my kids outside the 210 day work year enable me to share that #.